A good backpacking stove is an essential part of every backpackers or campers adventure kit. Some warm food or a steaming cup of coffee is the best way to treat yourself after a long day of hiking, kayaking, climbing or mountaineering. Backpacking stoves can greatly enhance your outdoor experience in a way few other pieces of gear can. Over the years a lot of new backpacking stoves have been developed, which is great, but it also means that finding the right one for you can be difficult. We have tested, analyzed and reviewed some of the best backpacking stoves on the market today, so you can easily find the right stove for your needs. Below are our top pics for the 10 best backpacking stoves of 2018. Looking for the best affordable backpacking stove on the market today? If we could only pick one, we would definitely go for the next-generation MSR PocketRocket 2. The PocketRocket 2 is one of the lightest backpacking stoves available (73 g) and packs some great performance in a tiny package. It’s surprisingly powerful with an output of 8200 BTU and can boil a liter of water in just under 4 minutes. The foldable pot supports make this backpacking stove very compact and easy to store (comes with hard case). The pot supports are made from stamped stainless steel and can accommodate a wide range of pot sizes. Folded open, the PocketRocket is roughly four and a half inches in diameter and three inches tall. There is quite a big gap between the burner head and the pot supports, so if you want to use a small mug or moka pot, you might have some stability issues. The pot supports work similarly to those of the MSR MicroRocket (folding and rotating) but the shape and gripping teeth have greatly been improved. The PocketRocket 2 has a traditional needle-valve system that works well. Needle valve systems control the flow of gas by twisting the needlepoint to adjust the flow of fuel compared to a regulator valve that also has a pressure regulator built into it. Simmer control is great and works well under normal conditions, but the needle-valve system can be problematic when it gets colder and the internal pressure drops. Just like other users, we found that the burner starts producing a smaller flame when the canister empties or when its cold outside. Other stoves solve this problem with a micro regulator system but are often a lot more expensive. The stove does have some wind protection, but it’s not as good as the SOTO windmaster for example. The WindClip windshield mainly ensures that the stove does not get blown out completely. It’s not super effective in blocking the wind, but does increase the stove’s efficiency in windy conditions and helps you burn less fuel. You can use an aftermarket windscreen, but it is not recommended by MSR as the canister could become dangerously hot and possibly explode. At only $5 dollar more than the original PocketRocket, this new version is still very affordable and offers fantastic value. The only thing we missed was a piezo igniter, but that doesn’t weigh up against its light weight, small size, simmering ability and fast boil time. Whether you are just looking for an easy to use, great performing backpacking stove or need something ultra light for your next backpacking adventure, the MSR PocketRocket 2 is the best affordable backpacking stove you can buy today. 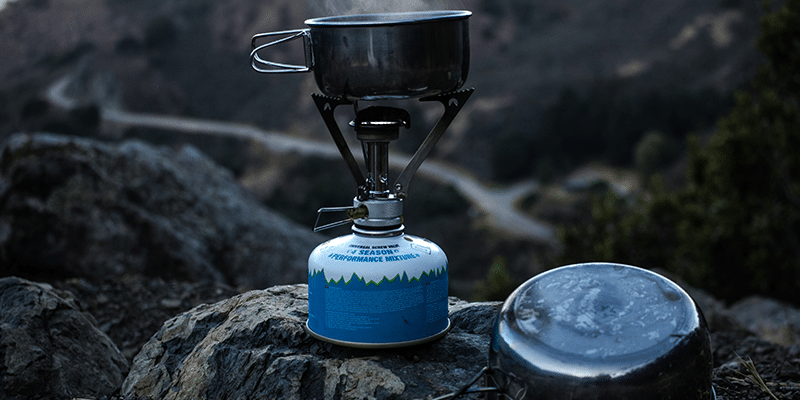 The award-winning MiniMo is by far the most popular regulated cooking system Jetboil has to offer. The redesigned regulator valve and cooking cup have greatly improved simmer control and the overall cooking experience. Out of the box, the Minimo is ideal for backpackers or campers that mostly eat dehydrated or very simple meals, but with its compatible accessories can be turned into a truly versatile cooking system that any camper/hiker will love. Its impressive boil time (2:15 for 0.5 liters), ease of use and fuel efficiency make this our Top Pick for Integrated Canister Stove Systems. Very few backpacking stoves offer the same performance and versatility as the MSR Whisperlite Universal. As one of the only stoves that works with both white gas and canister fuel, it combines all the great features and reliability of liquid fuel stoves, with the ease of use and great simmer control of a standard canister stove. From boiling water while mountaineering at 10.000 feet (-5°C) to cooking pancakes back in the valley the morning after, the MSR Whisperlite Universal performed equally well and has been one of our favorite backpacking stoves ever since it came out. 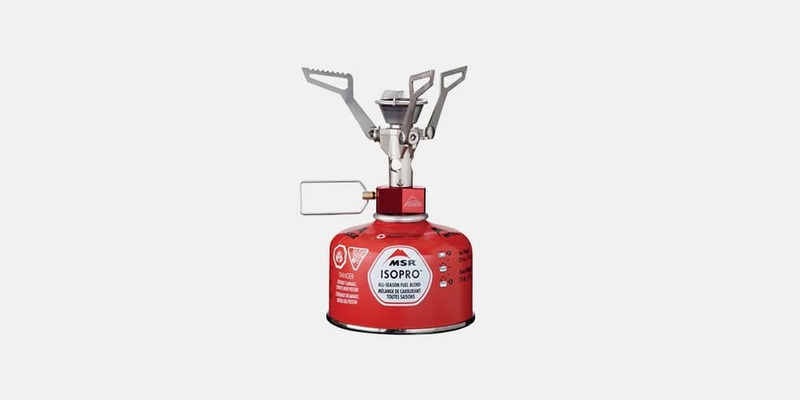 Whether you need a stove for expedition style trips, larger groups or thru-hikes, the MSR Whisperlite Universal is the best liquid fuel stove on the market today. The stainless-steel pot supports can fold together, making cleaning, storage, and maintenance easy. They provide a stable base for medium and larger pots. The stove can support cookware up to 4.5 kg or 10 lbs. Sadly, there is quite a big gap in the center when they are folded open. This means that you can only properly use this stove with pots that are bigger than 3 inches or 8 centimeters. After you have learned how to properly start and use a liquid fuel stove, the Whisperlite is quite easy to use. It does not come with a piezo igniter, so don’t forget to bring matches or a lighter. Changing between different fuel types is a bit more complicated and requires you to change the fuel adapter at the end of the fuel line and the corresponding shaker jets. The Universal comes with all the tools necessary to do this and do maintenance in the field. The fuel jets can be cleaned by shaking the base of the stove (‘shaker jet technology’), this means you almost never have to deal with a clogged jet. If you burn a lot of dirty fuels (some types of gasoline), it’s best to switch to a larger jet. Troubleshooting, cleaning and repairing the Whisperlite Universal is relatively easy, which is great when you are on a multi-week expedition. 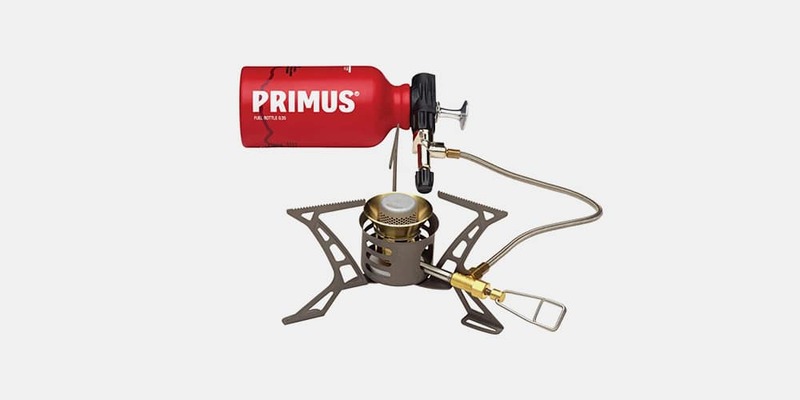 The Universal is about as fuel efficient as other liquid fuel stoves like the Primus Omnilite TI. When using it with a gas canister, it’s only slightly less efficient than other small canister stoves. The Universal can be used with white gas, kerosene, unleaded gasoline and isobutane-propane canisters. 1 oz. of white gas fuel can boil 1.3 liters of water. When using kerosene or MSR IsoPro fuel, 1.6 and 1.8 liters respectively. Although less efficient, white gas does put out a lot more heat, so it can boil 1 liter of water faster than other fuel types. 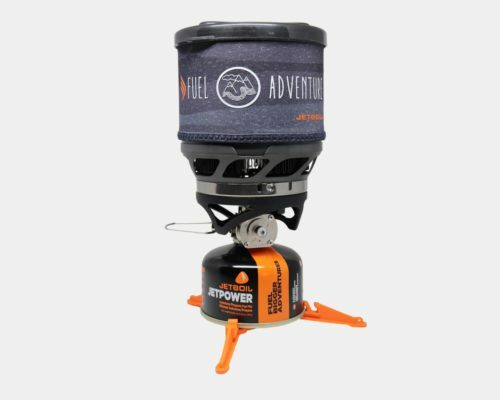 The Whisperlite Universal weighs 13.7 ounces, with stove, pump & canister mount. This does not include the fuel tank, so it is quite a bit heavier than your typical canister stove. This type of stove is typically used during expeditions or when traveling with larger groups, so weight is often not an issue and should not be the deciding factor when buying this backpacking stove. When using the Whisperlite Universal with liquid fuel, you will quickly find that simmer control is pretty bad. Trying to turn down the heat often results in the stove going out. One way to control the heat output is by varying the pressure in the fuel tank, which can be accomplished by more or fewer pumps from the fuel pump. The poor simmer control is often not really a problem, especially when boiling water or cooking with large pots/pans. Luckily the Whisperlite can also be used with fuel canisters. When using it with this setup, simmer control is great (just as good as other canister stoves). The canister gets mounted with a different style of regulator than that is used on the fuel pump. The ability to simmer allows you to cook many more meals, that are normally not possible with the classic Whisperlite or other liquid fuel stoves. Since the MSR Whisperlite Universal uses a fuel line, it’s safe to use it with a windscreen around the stove. There is no risk of potentially overheating the fuel canister or fuel tank. The stove comes with an aluminium windscreen & heat reflector. These greatly help with wind performance and boil times, especially in cold conditions. It can be difficult to get the reflector flat as you need to fold it up for storage. I recommend wrapping it around the fuel tank instead, together with the windshield, which makes storing and unwrapping a lot easier. The Whisperlite Universal produces slightly more BTUs while using white gas over canister fuel. With 9700 BTU using white gas, it can boil a liter of water in roughly 3:45. Quite impressive. As mentioned above, liquid fuel stoves excel in cold temperatures and windy conditions. The Universal is no exception. 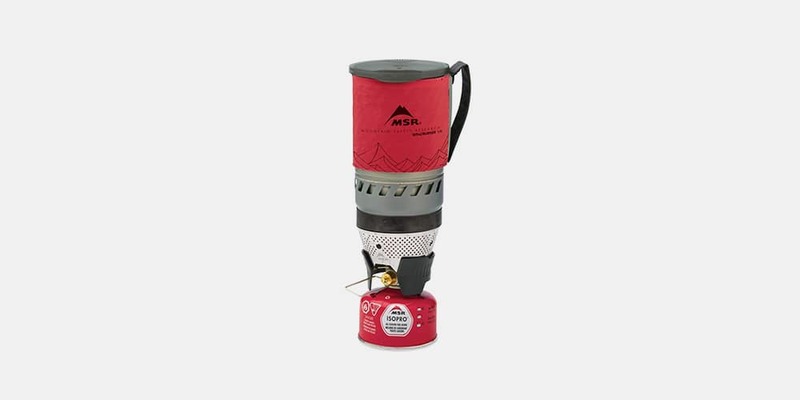 O have successfully used it at high elevation and harsh environments many times, while other stoves failed to boil water or simply didn’t work. The MSR Whisperlite Universal is a great all-rounder; great performance, reliability, and versatility make it one of the best backpacking stoves out there. 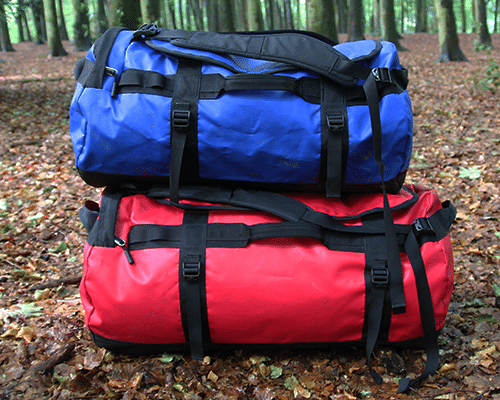 It is excellent for larger groups, mountaineering, cold temperatures and extended trips into the backcountry. The canister adapter allows for more precise temperature control and greatly enhances the cooking experience. When you need a stove that you can depend on and use in all kinds of environments, the Whisperlite Universal is a great pick. It is quite expensive, but it is the best liquid fuel stove on the market. It’s pretty amazing that you can buy a backpacking stove with simmer control, piezo igniter, foldable pot supports and a hard case for under 15 dollars. The Etekcity Ultralight, might not be the lightest or highest quality stove, but it’s definitely the stove that gives you the highest value for your money. It mostly performs just as well as other stoves in warm and low wind conditions, only to fall short when it gets colder, at higher elevations or in windy environments. Its low price, but still impressive performance make it the perfect stove for a tight budget, or if you are looking for a backup/emergency stove. The piezo igniter on the Etekcity Ultralight works great but is not as robust as some of the other stoves in this list. It is positioned on the outside of the stove body, making it more prone to getting damaged in transport. Quite a lot of people reported that the ignition system stopped working after a couple days of use. Etekcity does have fantastic customer service, so if you have any problems with your stove, they most often will just send you a free replacement. Simmer control works great. The stove uses a standard needle valve system, so don’t expect fantastic performance during the winter months or at high elevation. The valve control lever flips up against the stove body, so the stove can be stored in it’s small but robust carrying case. The foldable pot supports can accommodate pots up to 7″ (18cm) in diameter. They fold up next to the fuel valve lever. At 3.2 ounces it is still super light and would be a great addition to your ultralight kit. This backpacking stove offers fantastic value for your money and is the best budget backpacking stove of 2018. The original Snow Peak Gigapower has been a reliable stove for years, although it didn’t boil water all that fast. This new version, the Gigapower 2.0, not only comes with a piezo igniter but boil times have also greatly been improved. This stove produces 10000 BTU, which boils a liter of water in 4:45 min:sec. It’s a bit heavier than it’s competition, but its rugged design will ensure great performance for years. The Gigapower 2.0 packs down about as small as the Pocket Rocket 2 and comes with a plastic storage case. The SOTO Windmaster is roughly 6 times as expensive as the Etekcity Ultralight, so is it really worth it? SOTO is a Japanese company that has been making innovative flaming devices since 1978. In 1990 the company launched SOTO Outdoors and started making high-quality backpacking stoves (SOTO means “Outdoors” in Japanese). SOTO started selling their stoves on the world market in 2010, so you might not have heard of them yet. 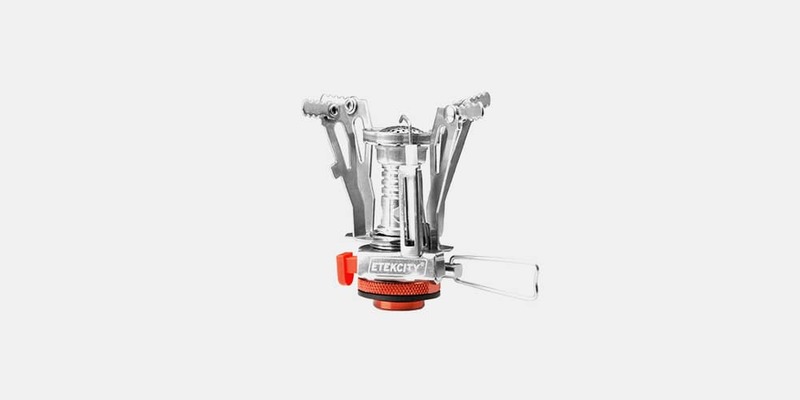 In the short period that they have been selling backpacking stoves, they have already received five industry awards for their flaming devices and for good reason. The main design objective for SOTO stoves is exceptional extreme weather performance. 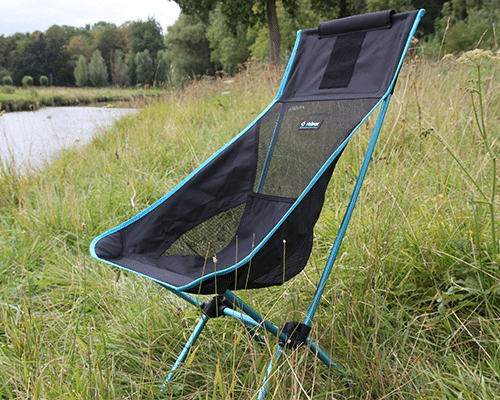 The SOTO Windmaster is specifically designed for windy conditions and works really well even when cold. The main design features of the SOTO Windmaster are its burner head and fuel valve system. The fuel valve is not your typical needle valve system but instead uses a custom micro-regulator. This micro-regulator can not only control the fuel flow, but also the fuel pressure. This means that when the pressure in the fuel canister drops (at high elevation, when cold, or if it’s almost empty), the stove can still create the same fuel flow and produce a large flame. The burner can be lit with a built-in piezo igniter. This one is built into the stove body, the ignition wires run through the central ‘tube’ of the stove. Only the ignition button sticks out a little further than we would have liked, the rest of the ignition system is well protected. The piezo igniter seems very reliable and it worked every time, during the last couple of months that we have used it. Now what about the wind performance, it’s called the Windburner for something right? The concave design of the burner head creates the effect of a built-in windscreen. The pot supports ensure that your cookware sits super close to the burner head. There is only a ~ 5 mm gap between the burner head and the bottom of the pot. This ensures that the stove still works efficiently in windy weather. The stove normally comes with the TriFlex pot support, an ultralight simple support, great for one person use. If you plan on cooking with larger pots and pans for multiple people, I highly recommend purchasing the stove with the optional 4Flex pot supports. The pot supports can be clipped on and easily taken off. I only ever use the stove with the 4Flex supports, so it can be a little annoying that the support is not permanently attached to the stove body. For more compact storage you need to take it off and clip it around the stove body. 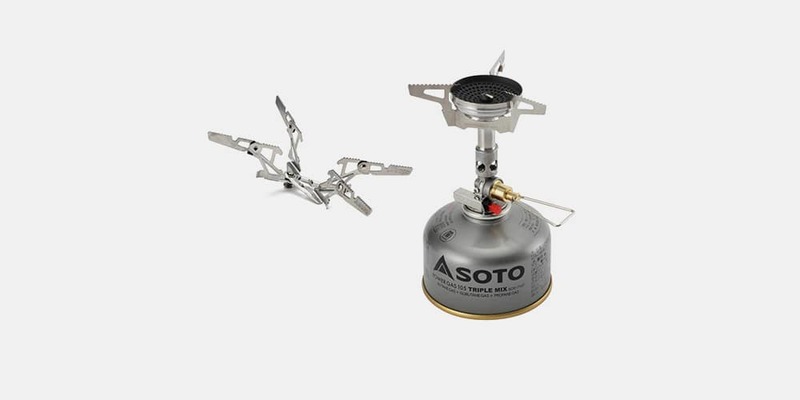 The SOTO WindMaster is quite expensive for a canister stove, but I personally feel like it’s worth the price. The stove is really well made and performs exceptionally well in harsh conditions. It has one of the highest power outputs with 11000 BTU and can burn 2 cups of water in under 2-1/2 minutes in strong winds. Each and every stove is manufactured and individually tested in Japan, so you can be sure that you get a stove that works well. The SOTO stoves can be a bit hard to find, but there is a combo set with the 4Flex supports available on Amazon. The Jetboil Flash has been updated for 2018 and is now even more impressive than before. This iconic stove can boil 0.5 liters of water in just 100 seconds! It is the fastest backcountry cooking system on the market and is the ideal for single person use. The Flash is compatible with the MiniMo cooking pots and accessories. 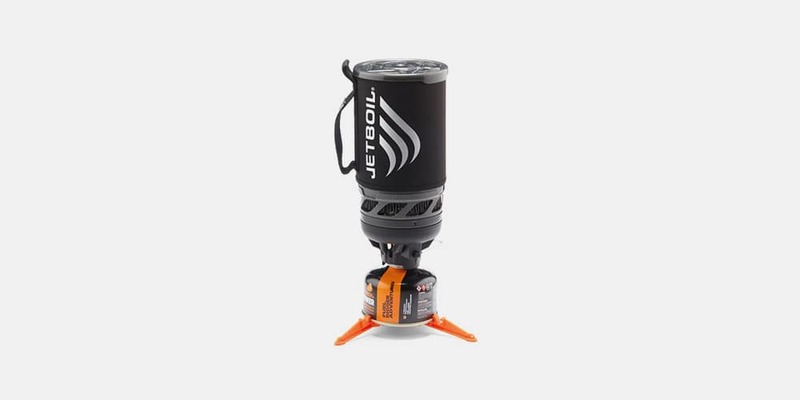 It mostly works in the same way as other Jetboil stoves but has some nice features on its own. The 1 Liter FluxRing cooking cup comes with an insulating cozy with color-changing heat indicator. This shows you when the water is boiling. The Flash comes with the same reliable push-button igniter as is found on the MiniMo and other Jetboil stoves. The MiniMo would be a better stove for larger groups and has a more convenient pot shape (low and wide). The Flash is really only suited for boiling water and doesn’t have good simmer control (it doesn’t use a micro regulator valve). If you want to cook more complex meals, the MiniMo would be a better choice, but for just boiling water the Flash is king. The MSR Windburner is the biggest competitor of the Jetboil MiniMo. The main advantage over the MiniMo is the excellent wind performance of this stove. The perforated metal shroud around the burner head greatly improves fuel efficiency in windy conditions. The MSR Windburner is quite a bit taller than the MiniMo, making it less stable and more difficult to eat out of. It does not have a push-button igniter, so be sure to always bring a lighter or matches. If you are often backpacking in exposed and windy locations, this stove is the better option over the Jetboil systems. The cookware comes with a built-in heat exchanger making this stove boil water faster and more fuel efficient than conventional stoves. The 1.0-liter pot also comes with an insulated cozy with handle. I personally prefer the more sturdy handles from the MiniMo. 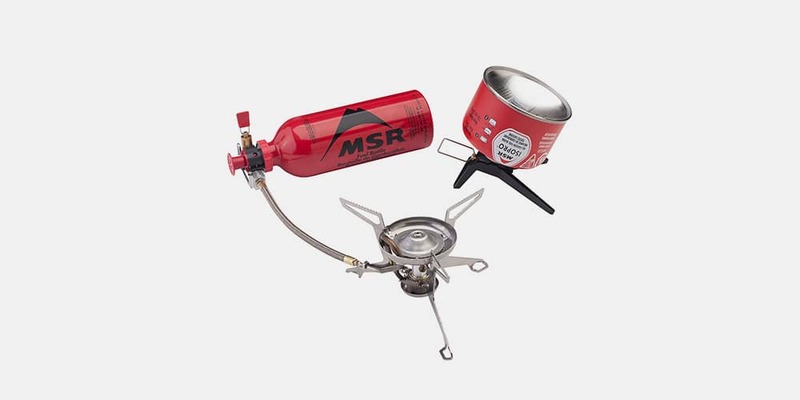 Just like other cooking systems, you can get a coffee press kit for the MSR Windburner. You can also use this stove with a larger 1.8 liter Duo pot & other compatible WindBurner cookware. The video below gives a good explanation of how to use the MSR Windburner. As the name suggests, the Primus OmniLite Ti is mostly made from titanium. It is about as light as the MSR Whisperlite Universal and can also work with both liquid fuel and isopropane gas canisters. It has good simmer control thanks to its dual valve setup and it’s multi-fuel capabilities make it a very versatile stove. Wouldn’t this then be the best liquid fuel stove to buy? Well, since it costs 100 dollars more than the Whisperlite Universal, it offers nowhere near as much value for your money. The extra costs give you a titanium stove body, which does help with weight reduction and the extra control valve is also a nice addition. If the extra 100 dollars isn’t an issue for you then its definitely a great performing stove to buy, but most people would probably be better served by a less expensive option. If you plan on buying this stove, be sure that it comes with the optional silencer. Without the silencer, the stove can sound a little bit like a jet engine, but the silencer does work exceptionally well. The stove does require a bit more maintenance compared to other stoves. It does not have a self-cleaning jet, but comes with a multi-tool with a cleaning needle. Cooking with gas or liquid fuels can get pretty boring after some time, but what if you could cook with wood and charge your phone at the same time? Luckily for us, the guys at BioLite have invented a stove that can do just that, the CampStove 2. This new version is an upgrade from the award-winning BioLite Campstove and features 50% more power, an integrated battery, and an updated LED dashboard. 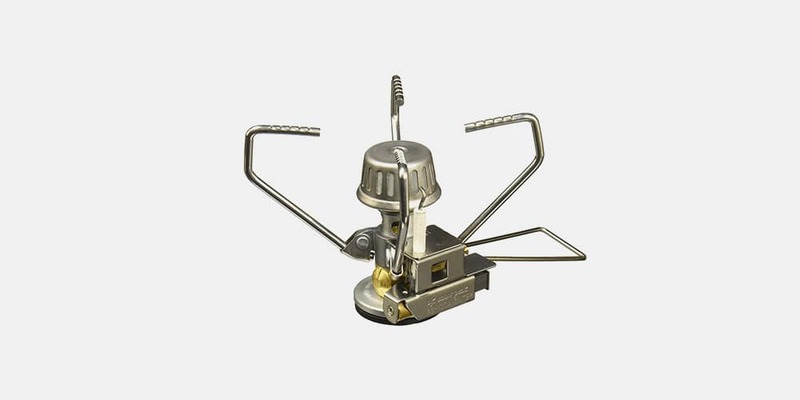 It is the only electricity generating wood camp stove on the market. By using a thermoelectric heat converter, the CampStove 2 can transform the waste heat generated by the stove into usable electricity. This powers a built-in fan, that creates a smokeless fire in the burn chamber. The rest of the generated electricity is used to charge an integrated 2600 mAh battery. The updated LED dashboard shows you the strength of your fire, the power that’s available and the fan speed levels. The fan speed can be adjusted (4 different levels) to control the size of the flames. On the previous version, there was no battery integrated into the system. This meant you had to get the fire going without the built-in fan, which could be difficult. After a while, the burn chamber would become hot enough for the system to start producing electricity and you could turn on the fan. This new version has an integrated 2600 mAh battery that can store energy when the stove is not in use. You can pre-charge the battery at home so you can immediately start using the fan and charge your phone. The stove can generate a maximum of 5V, 2A USB output, but it is often a lot lower. The previous version barely managed to charge your phone, but now the power output is increased by 50% and you can use the built-in battery as backup. As far as fuel is concerned, you can pretty much use anything that you find laying on the forest floor. Sticks, twigs and my personal favorite, pine cones all work great. Depending on the size of your fire, the CampStove 2 can boil a liter of water in roughly 4.5 minutes. The stove comes with a USB powered Flexlight. This handy light produces about 100 lumens and allows you to see what you’re doing while cooking. You can use the CampStove with ordinary pots and pans, but its pot support is not super stable and the soot of the fire can make your cookware pretty dirty. I prefer to use the stove with the optional KettlePot and Portable Grill. These are specifically designed to fit on the scalloped pot stand. The 3 foldable aluminium legs provide a stable base for cooking and can easily be folded up for storage. The stove comes with a stuff sack. Since the stove is quite heavy, it weighs 2.06 lbs (935g), it is not something you would bring on your typical backpacking trip. I usually like to use it when I am out camping with friends and can use a car to transport all my gear. It’s a lot of fun to use and makes the whole cooking experience something different. It’s quite expensive, but the fuel it burns is usually free. If you are looking for a unique stove system and like to charge your phone, headlamp and other small electronics while cooking, then the BioLite Campstove 2 is definitely for you. Be aware that you are often not allowed to use the Campstove 2 if there is a fire ban in your area. Liquid fuel stoves typically run on white gas, also known as camp fuel (Primus PowerFuel, Coleman Fuel etc.). White gas burns at a higher temperature than the propane/isobutane mix that is found in standard gas canisters. A liquid fuel backpacking stove therefore often cranks out more BTUs than a canister stove equivalent. Before you can use a liquid fuel stove, you have to manually pressurize the fuel tank with a pump. You will also need to prime or preheat the stove, which allows the stove to convert the liquid fuel to a gas for efficient performance. All this setup may seem like an inconvenience and takes some time, but it is also part of the versatile benefit of a liquid fuel system. Let me explain. 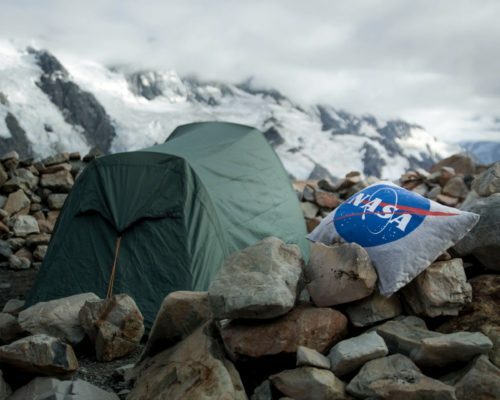 If you have ever camped at high elevation or tried to use a canister stove at low temperatures, you have probably been left frustrated and hungry because your stove stopped working. The lower temperatures cause the pressure in the canister to go down and therefore canister stoves are often rendered useless in freezing temperatures. Because you create the pressure manually in liquid fuel stoves, these systems are unaffected by winter weather. The performance of a canister stove will also go down as the canister empties, unlike a liquid fuel stove that can keep performing until you need to refill the fuel bottle. Still, gas canister stoves are extremely practical and perfect in most cases. They are very easy to use and if your model has a piezo igniter, can be started with the push of a button. Some fuel canister manufacturers even have special fuel blends for winter conditions, that can help their performance a bit. Boil times are highly dependent on conditions. Wind, temperature, and elevation play a huge role in backpacking stove performance and therefore the boil times mentioned in the comparison table below should be taken with a grain of salt. The boil times presented in the table are based on testing in indoor conditions and averaged with the specs provided by the manufacturer. They give you a good starting point for deciding which stove to buy, but it is also important to look at their other features. Some stoves have added wind protection, greatly reducing boil times in windy conditions. Another thing to consider is the amount of water you are usually going to boil. 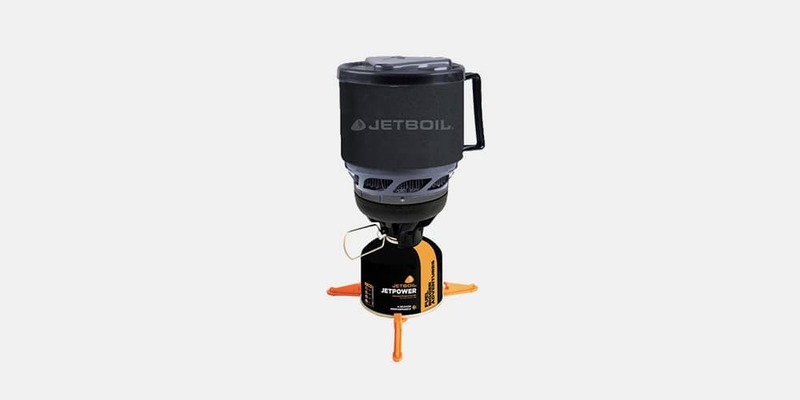 The Jetboil flash, for example, is optimized to heat 0.5 liters of water in under 100 seconds. The boil time for 1 L is therefore not a very good indicator. What type of backpacking stove should I get? If you mainly want to cook food or make coffee in the morning and don’t plan on cooking on top of a mountain or during winter, then a canister stove is probably the best choice for you. If you want some more power and performance during winter time or at high elevation, go for a liquid fuel stove. Cooking systems, also known as integrated canister stoves, are extremely handy if you are backpacking by yourself, or only want to boil water. 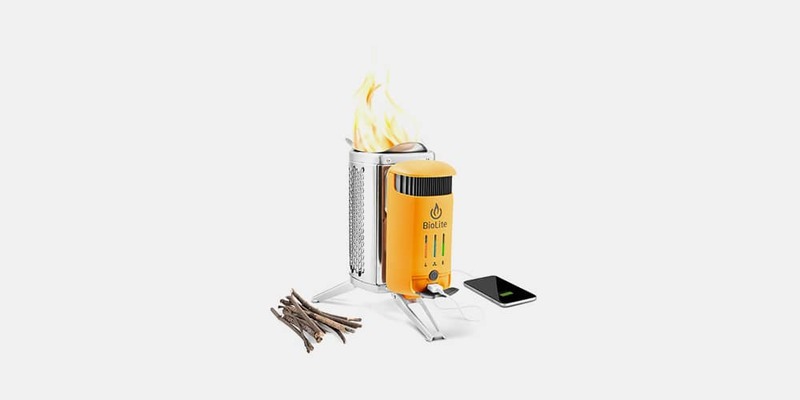 Want to charge your phone while cooking and like to build fires? Then take a look at the BioLite Campstove 2.